Hello, friends! Today I'm sharing a very simple tip for cleaning your microwave. I learned this method over 10 years ago and have been doing it this way ever since. 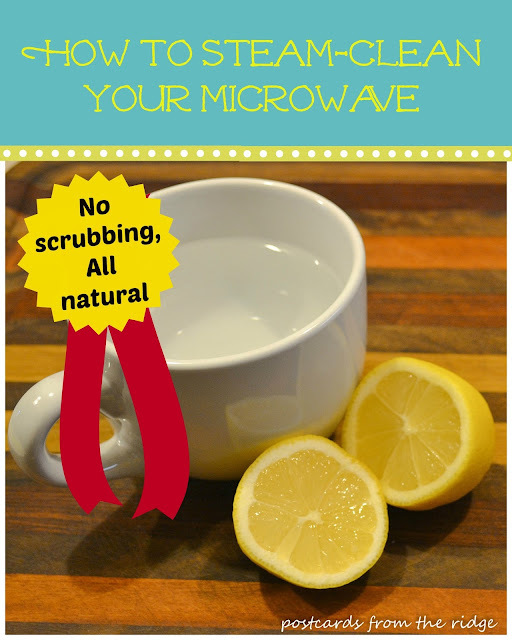 It involves no chemicals, no scrubbing, and is so simple you won't believe it. The ugly truth. Actually it's been worse than this before, but you get the picture. 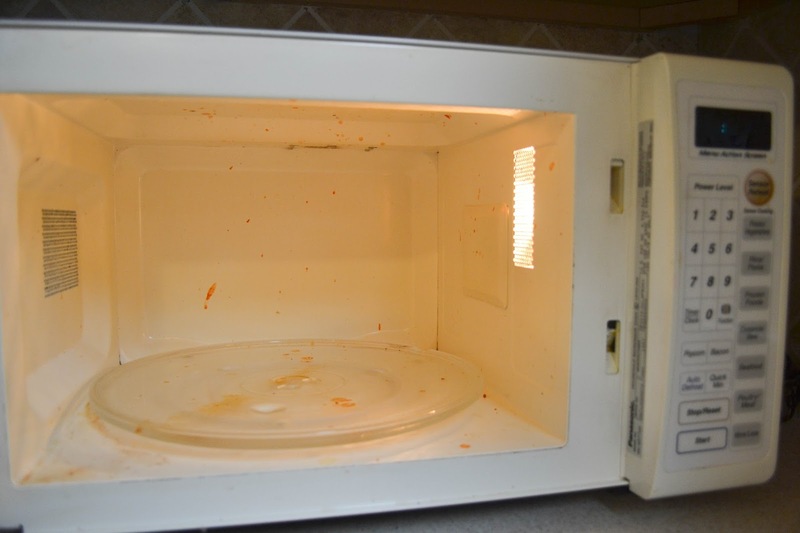 As many times as I remind the kids and the mister to cover their food before warming it in the microwave, sometimes they still forget. And this is what I find sometime later. Long after it has dried, of course. After reminding them for the umpteenth time to PLEASE cover their food, I go ahead and clean it before it gets even worse. But the way I clean it is pretty easy, so I can't complain too much. All you need for this task is tap water, a microwaveable cup or bowl, paper towels or cleaning rag and (optional) lemons. 2. Fill it about 2/3 full of tap water. 3. 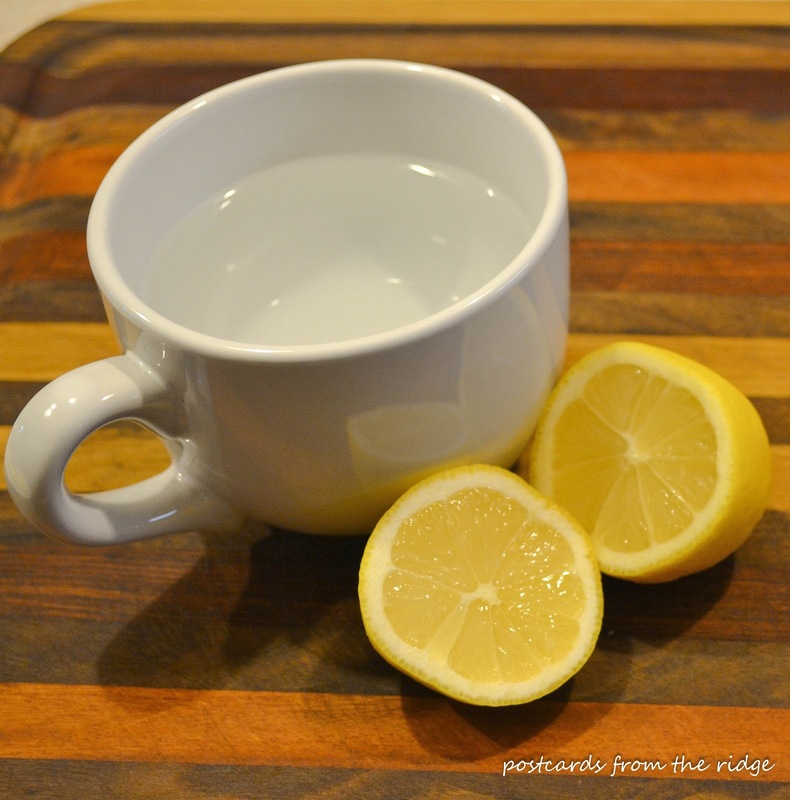 (Optional) If you have any lemons, add some fresh lemon juice to the water. This is optional. Using water alone works just fine, and that's how I usually do it. I happened to have lemons on the day I took these photos. The lemons just make it smell a little nicer, and then you can use the peel to freshen up the disposal when you're finished with them here. Just cut it into small pieces, drop them into the disposal, and grind them up. Bonus tip for you right there, folks. 5. At the end of that 5 minutes, the steam from the water will have softened the gunk, so now all you will have to do is wipe it clean with some dry paper towels. 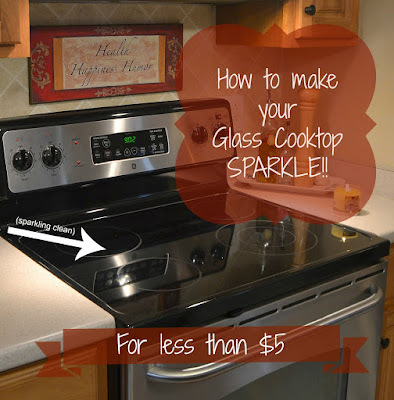 This works great for food spills, but won't necessarily remove stains. I haven't found a great way to do that, but will share it if I find something that works. 6. 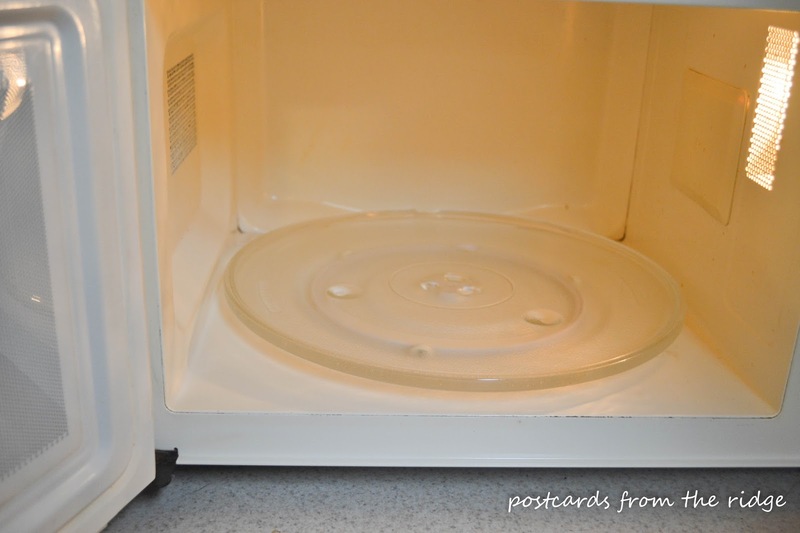 Remove the glass tray on the bottom and wipe it clean with some clean paper towels dipped in the hot water. The gunk comes off of it easily after being steamed. Sometimes I do have to actually use dish soap on it, but not usually. It just depends on what's stuck to it. That's it. Simple as that. When someone showed this technique to me several years ago, it was one of those things that made me smack my forehead because I couldn't believe how easy it was. No expense. Unless you use a lemon. And they're pretty cheap. This is awesome-I'm going to try it! Angie.....I love not having to slave over a micro wave. 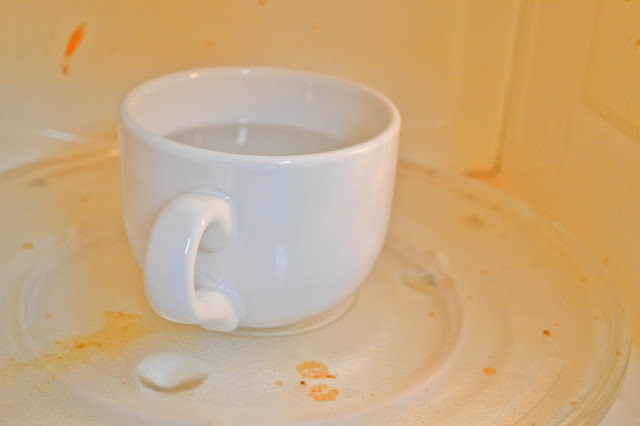 I did see somewhere that if you add vinegar to the water prior to steaming it does remove some stain. Speghetti sause?. The top of the inside chamber of my wave never seems to ever look clean. And it kills my neck trying to see if I got everything. I just want to turn the darn thing upside down to really scrub it. No I never done that yet? Thought is still there tho. Great tip! I've used wet paper towels, but never a lemon. Hi Amy. The lemon makes is smell nice and fresh, but I really don't think it cleans it any better. Thanks for dropping by! Yes, I use this tip at home. Lemon works and it's so natural! Thank you Angie.